The A350-900 test flight programme continues apace. MSN003 started its engines for the first time yesterday; MSN001 having pushed past 250 flight hours – with its tail bumper installed (see right) – this week took to Châlons Vatry Airport to begin one of its most spectacular of tests: Velocity Minimum Unstick (VMU) testing. VMU is an intense series of tests used to determine the minimum speed at which the A350 will become airborne. During testing the pilots over-rotate the aircraft as early as possible to the maximum angle of attack allowed on the ground, until the tail bumper settles and drags along the runway. This angle of attack is held until the aircraft becomes airborne, or ‘unsticks’. To ensure accuracy of measurements, and mitigate risk of damage the airframe, testing is undertaken in calm conditions with a maximum wind speed of five knots. The idea is to achieve a soft, not hard, ‘touchdown’ of the tail bumper. While section 19 at the rear of the aircraft where the tail bumper is installed is structurally reinforced, during VMU testing the area and tail section is required to support a weight of up to 150 tonnes, and a hard touchdown could stress and damage the airframe. Why does Airbus undertake VMU testing? 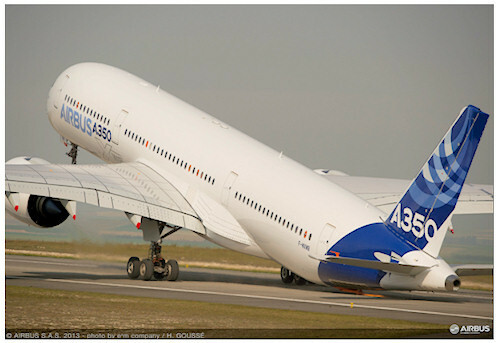 As the foundation of takeoff performance, knowing the VMU of an aircraft allows Airbus to accurately determine the A350’s “V” decision speeds – V1, V Rotate, V2 – calculated by applying margins of error above the VMU speed. In a similar way Airbus determines all other operating “V” speeds for the aircraft at all points of the A350’s flight envelope. No doubt Airbus will release a spectacular video of the testing, in the meantime they have a great diagramatic explanation of takeoff and departure operating speeds here. Airbus’ A350 MSN001 undertaking VMU speed testing. Image: Airbus S.A.S. Loved the site and cannot wait for the first A350 to come to adelaide through Qatar airlines in may next year and I can book a flight to Paris or any where for that matter !